Whether it is a social group outing, a retreat, a team building event for your workers or a night out, coming to Ellesmere Port Minibus for help is an excellent choice. Our company has a fleet of road-worthy and luxurious 33 seater vehicles that you cabin book and use at the time of your choice. We have a team of reliable customer support team and professional drivers to ensure that all your trips are hassle-free and timely. If you wish to experience the best form of transport services at the most competitive rates in Ellesmere Port, then we are the company you should employ. You can sit back, relax and travel in comfort, knowing that our 33 Seater Minibuses are free of any underlying issues. Just like the rest of our cars, our 33 Seater buses are well-kept, always freshly clean and sleek enough so that you can arrive in nothing less of style and class. The 33 seater vehicles come fully fitted with advanced technology and beautiful interiors. We promise that you will take delight in the trip, under the care of our highly qualified and expert drivers. With this coach, you can go with members of your group on a visit to the seaside or any other location. It is highly affordable. 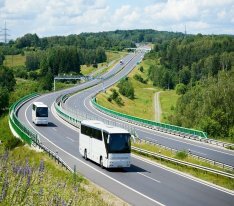 We also have experienced drivers that can take your groups on medium or long journeys safely.